RADAR CHECK: We have a number of showers and storms in progress across Alabama this afternoon; heavy rain is falling in spots across the central counties of the state. Heat is not an issue today thanks to clouds and showers. Many communities are only in the 70s at mid-afternoon. We will maintain some risk of rain at times tonight thanks to an upper trough west of Alabama. FRIDAY AND THE WEEKEND: There won’t be much change in the weather situation Friday; the sky will be occasionally cloudy with scattered to numerous showers and thunderstorms. 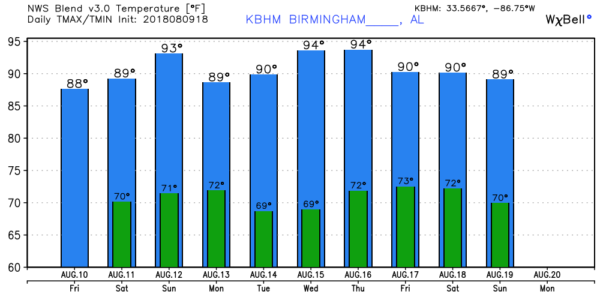 The high will be in the mid to upper 80s, below average for mid-August in Alabama. Then, the upper trough will move east of Alabama Friday night, and the weekend will be considerably drier thanks to sinking air motion. We expect a good supply of sunshine both Saturday and Sunday with only isolated afternoon showers or thunderstorms. Temperatures will creep upward, with highs between 89 and 92 both days. NEXT WEEK: Scattered showers and storms are possible Monday thanks to a surface front approaching from the north; then another surge of drier air moves into the state. Tuesday and Wednesday look mostly rain-free with only isolated showers; look for lots of sun both days with highs in the low 90s. Then, next Thursday and Friday, the sky will be partly sunny with potential for scattered, mostly afternoon and evening showers and thunderstorms. TROPICS: Tropical Storm Debby is dissipating in the North Atlantic. Elsewhere, a tropical wave has emerged off the coast of Africa, but development is not expected because of cooler-than-average sea surface temperatures and dry air. The rest of the Atlantic basin is quiet.